Carnival Cruise Line has decided Carnival Spirit will now remain in Australia year round during 2018 due to the strength of Australian demand. The ship will not go to China during the northern summer. It's that time of year again. It's the time when fans of top entertainment should mark their calendar and make a reservation on Princess. 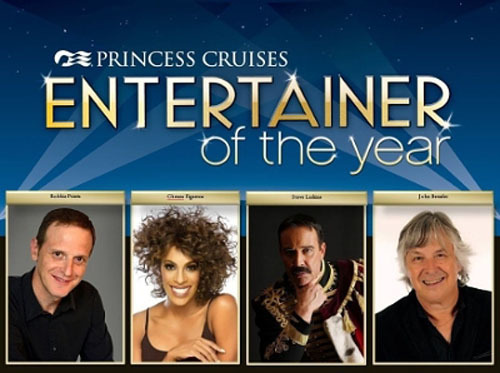 Princess Cruises has chosen the four finalists in their Entertainer of the Year competition, and they will all perform aboard Ruby Princess' February 25th seven-night cruise from Los Angeles to Mexico. After seeing a show performed by each, the passengers will select the winner. The complete story appeared in the October 28 edition of Cruise News Daily. At a major presentation last night in London, P&O Cruises began to pull back the curtain slightly to give the world a small peek at the new 180,000-ton ship they will put into service in 2020. Like when they introduced Britannia, it's obvious they've spent a lot of time considering what British travelers are going to want in the future, and to meet those desires, P&O adding new concepts and updating others. They've already partnered with top interior architects to create a striking new ship. 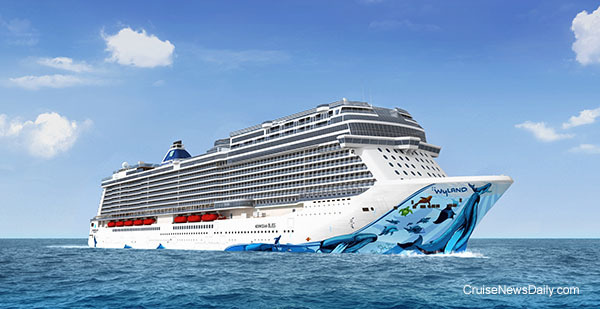 Norwegian Cruise Line unveiled the hull artwork today for Norwegian Bliss, the 167,800-ton Breakaway Plus-class ship that will begin sailing from Seattle to Alaska in 2018. Called “Cruising with the Whales,” the mural features the image of a mother humpback whale and her calf as the centerpiece of the design, created by marine life artist Wyland. Copyright Norwegian Cruise Line. All rights reserved. May not be copied of used without permission. Norwegian Cruise Line has decided to delay the reopening of Great Stirrup Cay until November 20. The island has been closed since August 25 for improvements that are part of the Norwegian Edge program. What Good Comes from the “Other” Itinerary? Most all the focus these days on Carnival's Fathom brand is on their cruises from Miami to Cuba. Many people seem to have forgotten Fathom's roots before Cuba approved their every-other-week program to that island. On the other weeks Fathom still go to the Dominican Republic where passengers still do social impact programs and meet the people of the DR. In 13 sailings to the DR, Fathom passengers have had a lasting impact on the people of the DR. The line has compiled some impressive figures. Disney will again keep their original ships on the move in 2018, basing them for short times in different cities to give their fans a broad range of itineraries and destinations. The complete story appeared in the October 25 edition of Cruise News Daily. Royal Caribbean choosing a "hometown hero" as godmother for Harmony of the Seas. Royal Princess arriving on US shores as the first Princess ship to be painted in the line's new livery. Details appeared in the October 25 edition of Cruise News Daily. Royal Caribbean gives us a sneak peak at another eye-popping special effect that will be a feature of an upcoming show. This one will be aboard Harmony of the Seas. While most passengers were asleep aboard Carnival Imagination last night, the US Coast Guard was flying above it saving the life of an 87-year-old female passenger. Imagination's crew contacted the Coast Guard's watchstanders at San Diego about 12:45am Monday morning reporting the woman had a head injury sustained in a fall and she was experiencing seizures. The Coast Guard flight surgeon recommended that the patient be medevaced and taken to a hospital for emergency care. A little more than two hours later, a Coast Guard MH-60 Jayhawk helicopter was above the deck of Carnival Imagination hoisting the woman aboard about 58 miles off the California coast. About an hour later she was on shore in an ambulance being taken to a San Diego hospital. In the video below you can see the rescue swimmer being lowered to the deck, the patient being hoisted and the rescue swimmer coming up. Note how steady the Coast Guard pilot keeps the helicopter positioned over the deck. This story appeared in the October 24 edition of Cruise News Daily. The crew of Holland America's Veendam was honored for the January 2015 rescue of a downed pilot 225 miles off the coast of Maui. Carnival Corp renewed Arnold Donald's employment contract for a year beyond his initial three-year contract. In the future it will be renewed automatically for one-year periods. Last year Mr. Donald's total compensation was a little more than $9.3 million. 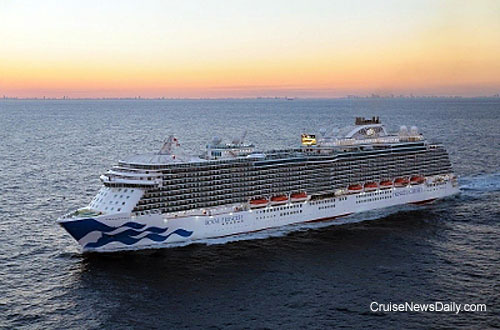 Princess Cruises confirmed to CND that Pacific Princess will return to service on Friday following the damage to the ship while arriving at Marseille earlier this month. The Sun Deck of AIDAluna was the setting for a fashion show by Jessica Minh Anh while it was docked in Manhattan Sunday. Later that evening the ship left on a 14-cruise along the East Coast of the US and Caribbean. Details appeared in the October 24 edition of Cruise News Daily. Photos copyright AIDA Cruises. All rights reserved. May not be copied or used without express permission.